For games, activities, and references for each chapter, click on the drop down menu under the Math heading. There are timed tests, references, and extensions on the Math Reference page. 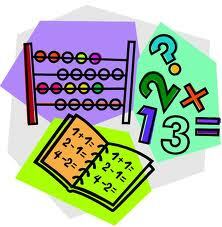 Please let me know if there are concepts or activities you'd like added to our math page. The IXL website is an excellent general resource for all things math. It is arranged by skill and grade level- that way if your child needs review, reinforcement, or extensions, you should be able to find it at IXL. Click here to play the problem solving game of Mancala. Click here for an animated, interactive online math dictionary.